When you get that itch to build something, it’s difficult to stop unless you achieve a feeling of accomplishment. And that’s how it was with [Rohit’s] boombox build. He started out with a failing stereo. He figured he could build a replacement himself that played digital media but his attempts at mating microcontrollers and SD cards was thwarted. His backup plan was to hit DX for a cheap player and he was not disappointed. The faceplate he found has slots for USB and SD card, 7-segment displays for feedback, and both buttons and a remote for control. But this little player is meant to feed an amplifier. Why buy one when you can build one? [Rohit] chose ST Micro’s little AMP called the TDA2030 in a Pentawatt package (this name for a zig-zag in-line package is new to us). We couldn’t find stocked chips from the usual suspects but there are distributors with singles in the $3.50-5 range. [Rohit] tried running it without a heat sink and it gets hot fast! If anyone has opinions on this choice of chip (or alternatives) we’d love to hear them. But we digress. With an amp taken care of he moved onto sourcing speakers. A bit of repair work on an upright set got them working again. The bulky speaker box has more than enough room for the amp and front-end, both of which are pretty tiny. The result is a standalone music player that he can be proud of having hacked it together himself. Humans generate a lot of waste. It is somewhat relieving to see so many great reuses of old items out there on the ‘web. 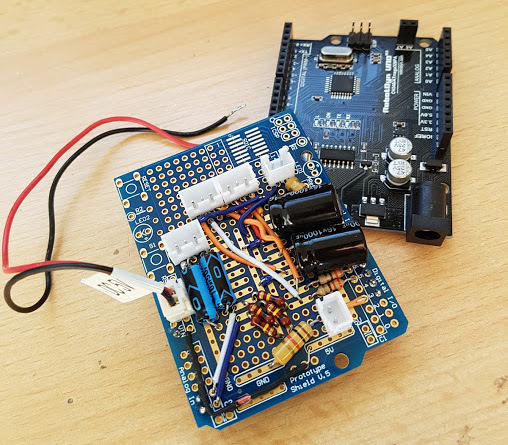 We love covering these types of projects here on Hackaday. 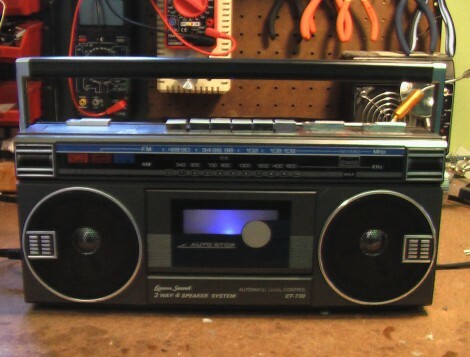 [Martin] likes using recycled items in his projects and wrote in to tell us about his recently completed Wooden Ghettoblaster that utilizes a bunch of old parts and doodads he had kicking around. The main case, believe it or not, is constructed of leftover wood flooring. The fake tape deck, buttons and tuner may look like they are just burnt/etched/stained but they are actually inlaid pieces of darker wood. Once all of the inlays were installed in the front face of the cabinet, the entire surface was sanded smooth and the edges chamfered to add some visual appeal. Holes for a pair of old aftermarket car speakers were not only cut into the front face of the case, they were also counterbored so the speakers would sit flush with the panel. [Martin] did decide to purchase one component for the project, a set of VU meters. They are mounted to the case via their own inlaid piece of wood and are connected in parallel with the line-level portion of the signal path.